The Gatling Groink (タマコキン?, lit. : "Ball Child Goldfish") is an enemy in Pikmin 2. It is a biomechatronical creature similar in size to an adult Bulborb. It reminds of a rotund goldfish, including a skin that resembles fish-scales and sports the typical orange and white coloring of goldfish. It further has two slender legs that end in web- or fin-like feet, what appears to be a windshield between its two forward-facing eyes, two upward exhaust pipes, a rotatable fin-like tail, and a mouthplate which covers both its underside and its retractable cannon. The cannon fires mortar rounds and is placed where a fish's mouth would typically be. The origins of the mechanical parts are unknown, much like the Man-at-Legs. Gatling Groinks can usually be seen patrolling caves and are known to seek out the active leader and his Pikmin. A different variation of the Groink is found stationary on top of hard-to-reach towers, giving it a wide attack range, which is especially annoying when they are in possession of a treasure and cannot merely be avoided. There are hence, two behaviors, one for walking around, shooting at short range, one for standing still and shooting enemies below at long range. This is evidenced by the fact that if a tower-standing Gatling Groink is taken down and left to be revived, it will not move from its spot. It attacks by initiating a cannon from its mouth and fires either one large or three small mortars (with little time between firings). When the shells hit the ground, they explode and scatter any of the Pikmin in range and kill those at the absolute center of the blast. Given unknown circumstances, Pikmin caught in the dead center will still survive. Rarely, the game may tally the surviving Pikmin for the death count. If used correctly and carefully, the Gatling Groink's cannon can be used to kill other enemies and even airborne enemies. To do this, the Gatling Groink must fire at the active leader while he is standing near or under an enemy. If this is done correctly, it should be able to kill most large ground enemies in three to four shots. The shells will not harm the Gatling Groink itself, however. It can also destroy every type of hazard except for bomb-rocks. This can be used to the player's advantage by having it destroy the two poison gates in the Wistful Wild. ↑ 1200 HP for the free-roaming version, 700 HP for the stationary version. ↑ 0.36 HP per second for the free-roaming version, 0.21 HP per second for the stationary version. In Challenge Mode's Secret Testing Range, if a Gatling Groink is allowed to regenerate after it dies, it will sometimes come back as a sped up version that walks and shoots four times faster than normal. Whether this is intended behavior or the result of a glitch is still unknown. Particularly: Double check that it does not attack if Pikmin are thrown at its tail. It could just be that it takes damage when the Pikmin are attacking the tail, and it reaches a pre-defined "big damage" point, where it shakes; the shake being unrelated to the tail per se. 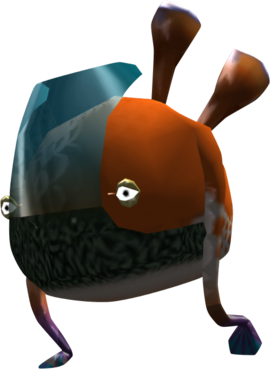 The best method to attack it is to throw Pikmin onto its sides and back, as the front has a protective shield. With Purple Pikmin, it is possible to throw them to the left or right of the protective shield while facing the enemy, and the Pikmin will stop after passing the shield and being on the creature's side to home-in on its body and attack there. Certainly the most effective strategy is to pummel it with heavy Purple Pikmin, as each one carries a chance of stunning the creature, preventing it from fighting back. Once defeated, this beast will begin to regenerate its health, just as the Spotty Bulbear does, making it crucial to carry it to the Onion, or Research Pod if underground. If not, it will revive within about two minutes, and then continue its attack. It is said in Olimar's notes that if its tail were incapacitated, it would be incapable of attacking; in fact, if Pikmin are thrown on the tail, it will be unable to use its mortar, but will attempt to shake them off. However, in the Cavern of Chaos, they are accompanied by many Dwarf Red Bulborbs, in which case using an ultra-bitter spray would be wise due to the Bulborbs. In the case of patrolling Gatling Groinks, it is also possible to attract the Groink's attention, and then move to a position in which a bottomless chasm is between the leader and the Groink. The Groink's stride is often high enough to step over the safety barriers that ordinarily stop leaders, Pikmin, and other monsters from falling into the chasms. In this case, the body will be irretrievable, although any treasures it may have been carrying will fall onto a random location on the map. If two Gatling Groinks are near each other, it is possible to have one Groink kill the other by shooting it; the other Groink should then be killed with Purple Pikmin. Another strategy is to use one lone leader as bait, to draw the Groink's attention, and then switch leaders and attack the distracted creature from behind. Idle leaders run about to try to avoid enemy attacks, so it's likely that the bait leader will suffer minimal damage from this strategy. Note that using an ultra-bitter spray on a Gatling Groink that has already fired some shots will make the shots disappear. This is a good way to save Pikmin that would otherwise be on the receiving end. The word "Gatling" is a reference to the Gatling-type cannons in real life. The name "Groink" seems entirely made up; it is possible to extract the onomatopoeia for pig grunts, "oink", thus contracting "grunt" and "oink" to "Groink". Though it's difficult to see how pigs factor into the creature's design, the "grunt" component is found again in the German localization. Its Japanese name, タマコキン?, translates to "Ball Child Goldfish", referring to how it looks like a goldfish and is round like a ball. The word "child" has no known explanation. Its scientific name Megaplod calibersi could be a corruption of the megapodes family of birds, though the similiarity between the Groink and these birds are few; it is perhaps worth noting that the megapodes build mounds, and the Groink's signature placement in the game is also atop of a mound, or rather a form of pillar. It is likely that the word "explosion" was worked into the name aswell due to the Groink's explosive attack. "Calibersi" seems to be a corruption of "caliber", a measure for the size of projectiles. Internally, the creature is known as minihoudai, a combination of "mini" and ほうだい?, which means "artillery battery". The name houdai is already taken by the Man-at-Legs. The mortar blast of a Gatling Groink. A Gatling Groink regenerating life. A Gatling Groink in the Piklopedia. Fighting two Gatling Groinks in an unused cave. Artwork of the Gatling Groink. The creature's e-card, #20 (15th yellow card). Particularly: Investigate the end of day cutscene thing further. The Gatling Groink, along with the Spotty Bulbear in Pikmin 2 are the only enemies that can revive after being defeated. In the Wistful Wild, if the Gatling Groink is in the end of day cutscene, it can actually shoot at the leaders and damage them. The leaders cannot be knocked down with this, however. The whistling heard when Gatling Groink pellets are flying is a modified version of the same whistle in Super Mario Sunshine when Bullet Bills are fired from cannons. The 3rd-Generation-Pokémon Grumpig is renamed Groink in the German versions, though this rather appears to be a coincidence as localization teams went for the same play on words. This page was last edited on March 22, 2019, at 18:43.